If your legs can be set on cruise control, mine definitely were dialed in at the Chicago Marathon. They kicked in as I crossed the start line on Columbus Ave. just after 7:30 a.m. and eased to a stop after crossing the finish line further south on Columbus after a roundabout city tour. No speed increase or sprint in the final 0.2 mile with the finish line in sight. No walking breaks through a water station, to catch my breath and reevaluate my strategy, or to stretch my tight calves. My Nike+ SportBand proves it too...when I synced the results post-race, my speed clocked at each dot on the screen (roughly each mile) was nearly the same across the board and formed one of the straightest lines I've seen when plotting race results. But no complaints because my race ended the exact way I thought was impossible after the season I've had. Instead of clocking a race that would only be special for the fact that it was my 10th Chicago Marathon in a row--something I was determined to notch even if I had to walk the entire 26.2--the race turned into my personal best. And more than a personal best as shown by the time: weather conditions, physical well-being and mental toughness were more than on par. Cold weather--my favorite--and unnoticeable wind, if any. Even the sun stayed around. Leg pains that have ailed me since June were nonexistent. And hip pains aggravated by the pavement pounding never arrived. Hitting the mental wall and not wanting to run anymore never happened. And as shocked as I am to present it, these had to help with the 3:38:24, a Boston qualifier, on the board. Right? I still don't know. I've over-analyzed, over-thought and over-examined the day's events in my head a million times to the point where I've over-exhausted the race and how I did or didn't prepare. It's only a marathon but yet all the forces collided for what I'd like to think was a near-perfect race day that I keep thinking that something had to go wrong somewhere but I just didn't notice it. And in hopes of keeping this success-track running, I'm writing it all down to repeat in the future (i.e. April's Boston Marathon where I've never had a good race although I partially chalk that up to training or lack of training through a Chicago winter). Or remember when I have another off training season. But I have to add a disclaimer not to try this on your own. I don't know how or why I ran as I did after not being able run--and barely walk--only a month ago after yanking my left left through 13.1 miles at the Rock N Roll Virginia Beach Half Marathon. But while grateful and elated, something has to be amiss. Not sure as to what but this type of race strategy should be shunned. But hey, Chicago Marathon No. 10 is in the books. From the pre-race 10 I displayed before darting into the start corrals (top photo) to what my mom likes to call the Miss America wave pose when I ran past my parents at mile 17 feeling far better than I had at that point in the last two years (middle photo). And then flashing that 10 again with my 10th medal around my neck and a smile on my face since I felt like I did the impossible (bottom photo). Congrats! Seems like you ran a serene and comfortable race, which despite all the odds or common wisdom really worked. If you can derive some wisdom from this and apply it to your next race, even better! Wow, nice job! Your 10th marathon in Chicago alone =WOW!! 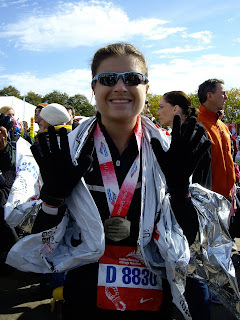 I was there for the marathon last year and the 85 degree temps did not a personal best make. I have to admit there was some raising of a shaken fist the sky over this years ideal (for me,love the cold weather!) temperature. 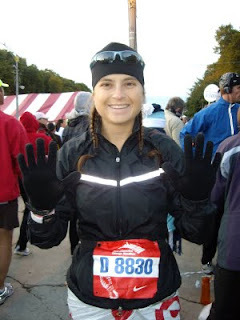 I hope to return to Chi-town and do that race again in cooler temps! Looking forward to hearing more about your race, again CONGRATS! Congrats on your race Kate! Thanks for the note! I hear you on the 85 degrees last year--it zapped my energy by mile 14. Awesome that you love the cold too. I was hoping that we'd get cold weather this year after two years of hot and can understand shaking the fist (I did that at Ironman Wisconsin this year, no wind although a little hot). But when my mom told me it might snow, I was getting a little scared. Hope you come back to run Chi-town soon! Thanks so much for reading and finding fit-ink :) hope all is well with you...chicago misses you!